Come check us out! 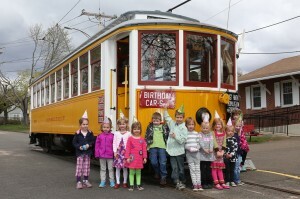 Our historic “party” trolley car #1602 is 104 years old this year and ready to host your special event. When you book a party, your group gets its very own trolley car for the ride and a uniformed tour guide-trolley operator. There’s room on the trolley for cake, ice cream or other food service and big windows for viewing the beautiful scenery. Included in the price is extra time before and after to set up and clean up, so everything will be just right. 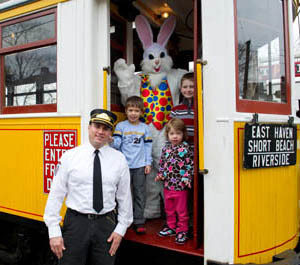 Our trolley cars are heated and we can accommodate parties and special events throughout the year. Plan to book at least three weeks in advance, dates fill up fast! Click here to learn more. Looking for a close by educational trip for your classroom or camp? Consider bringing them to the Shore Line Trolley Museum. We are located in East Haven, a mile and a half from I-95. We are a 501(c)3 educational facility. 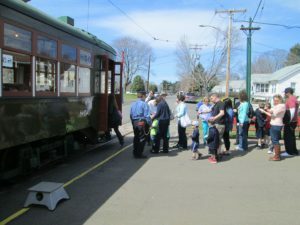 Not only will children get a re-live a time period considered to be the golden age of transportation, they will get an education about how trolley cars were in almost every town in Connecticut and the impact they had in making Connecticut grow from late 1800’s through the end of World War II. Click here to learn more. We are open for seasonal events, private parties and charters. Some special events have different ticket prices — for details, please consult the specific event page. Your ticket includes all-day access to the museum, including unlimited rides on the historic trolley line, tours of the trolley display buildings, and access to our indoor museum exhibit room. Online tickets purchased for specific events may be exchanged at their face value for alternate events. Private event deposits are fully refundable if cancelled prior to 48 hours before the event. Private event deposits can also be exchanged for future events. Membership fees are non-refundable. Enjoy a three mile leisurely round trip onboard a restored historic trolley car through the scenic Branford salt marshes near Long Island Sound. Learn about the history of trolley development and trolleys in Connecticut and beyond from our expert trolley operators/tour guides. Tour our trolley display buildings and our indoor exhibit room to understand how trolleys played a role in the development of America as we know it today.